Carte des Gouvernements de Lorraine et D'Alsace. A beautiful example of Rigobert Bonne's decorative map of the French winemaking regions of Alsace and Lorraine. Covers from Champagne east to Souabe, north to Luxembourg, and south to Switzerland. This region, which traded hands several times between France and Germany, is known for its exceptional cuisine, wines, and unique culture. A large decorative title cartouche appears in the lower right quadrant. Drawn by R. Bonne in 1771 for issue as plate no. 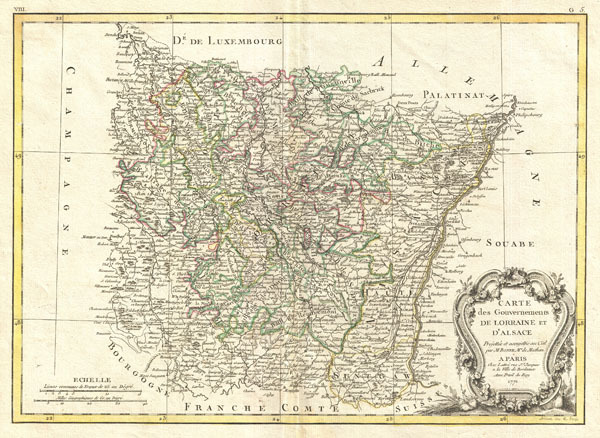 G 5 in Jean Lattre's 1776 issue of the Atlas Moderne. Rumsey 2612.013. Phillips (Atlases) 664. National Maritime Museum, 215.